Bunnies are funny, and Mrs. Gary Nibbets, also known as Mrs. G. or Gigi, shows it when she zooms through her cardboard box tunnel each day. She also “loves to hop on our couch and then hop up onto the top of her condo and survey her domain,” says Jess Birken, whose family adopted Mrs. G. from Minnesota Companion Rabbit Society after spotting her on Petfinder. Mrs. G likes to hang out with her family. The condo is a two-level 4×8’ cube that Jess has furnished with boxes and blankets and a stuffed bunny to keep Mrs. G comfy and cozy. One of the cool things about rabbits as pets is that they are tidy. Mrs. G uses a litter box both in her condo and when she is roaming around the house. Mrs. G enjoys a variety of foods, including rabbit pellets and timothy and orchard grass hay. Fresh veggies are always on the menu, and Jess says the bunny is a good influence on her daughters, Samantha, 5, and Alexandra, 8, who now ask for their own veggies when it’s bunny dinnertime. 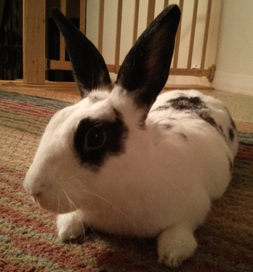 February is Adopt-A-Rescued-Rabbit Month, a good time to adopt some bunny to love. Learn more about rabbits and their care.